The king of ecommerce retail Amazon is still struggling to be in the field of low-cost tablets. This year they offer only limited two models. 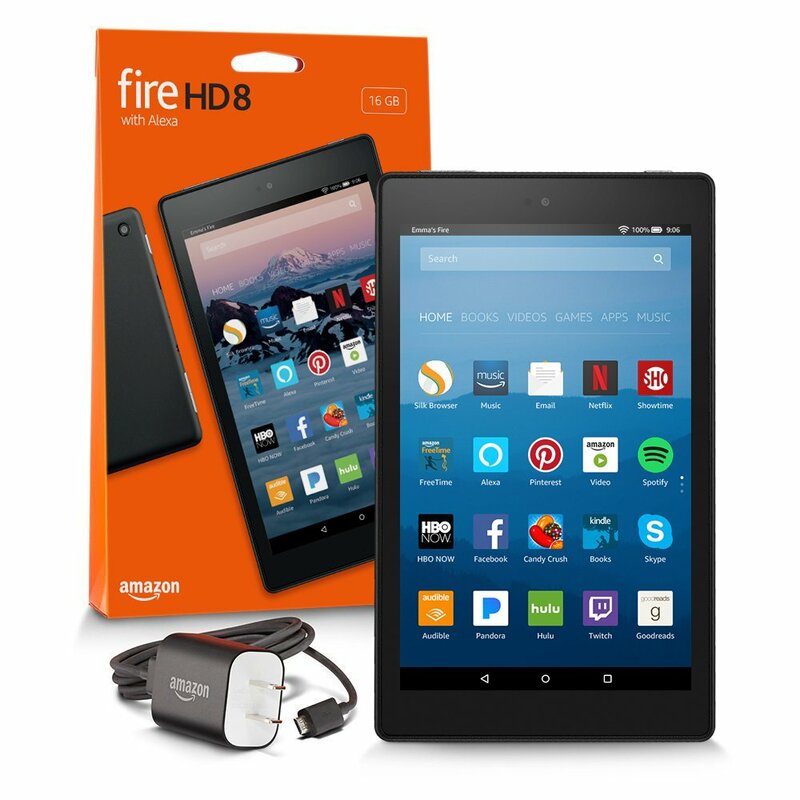 Amazon new kindle fire Fire HD 8 & 7 tablets has its excellent value for money. That offer all the features in 16: 9 format (elongated). Since its first generation, Amazon has managed to make an impression in the market with its own tablets based on Android. What is the key of Amazon? Offering an overwhelming quality / price ratio, something they have expert from day by day. Although not as economical as the Fire 7, this analysis of the Fire HD 8 shows us a tablet that wants to top the sales of the 8 “cheaper tablets, without losing sight of offer features that allow a solvent use in Multimedia, the main objective of this model. The new tablets inherit the traits that have marked this product since always, with plastic as the main material and the operating system itself. Let us see it in depth. We discuss about a very robust tablet, matte black finish is quite sober, with rounded edges that facilitate its grip, and a slightly rough surface that offers good adhesion. On the top side, we find the button off, the port of 3.5mm jack, microphone and volume buttons (also realized in plastic, but painted in a silver color). These buttons, say that depending on the orientation of the screen will change so that changing the volume is more intuitive. On the right side we find the slot for microSD cards (that can reach 200 GB of memory), while on the other side we have two speakers. A weird location, but that does not look too bad. In addition, a micro USB socket and the audio jack in upper part of the tablet. You may find the front camera located in the center of the upper edge, near all these connections. While the main camera is in the upper right corner, just above the Amazon logo with a glossy piano black finish. When we turned on the Amazon new kindle fire HD 8 we were pleasantly surprised at the brightness of the screen. The screen has an IPS panel with HD resolution. Real colors and good viewing angles something we appreciate from the first moment, with a suitable content visualization even with the brightness set at 50%. Even in outdoors, it will not any problem to use this tablet, there is no anti-reflection matter. So in full sun the experience ends up being quite inferior. As, IPS panel that gives us a good color quality and allows us to visualize with fidelity the colors. In addition, we know of IPS technology that allows good viewing angles. With a resolution of 1280 by 800 pixels, this 8-inch screen gets a density of 189 pixels per inch, a figure that still stands above many computers, but which in tablets starts to sound small. But finding a higher figure is not something that we can easily find in models of this range, and we would have to go to much more expensive tablets. On the opposite side there are two speakers, and include Dolbyt Atmos technology with this tablet. Synonymous with standard sound quality. No doubt, they are better designed for playing games or videos horizontally. Now come to the power source of battery. There is no mention of the capacity of it. Only a theoretical autonomy of 12 hours of use. But we see that its size amounts to a generous 4750 mAh. In fact, we were surprised that in the battery test of the Geekbench3, has reached almost 12 hours of screen. Something we did not expect, and proves the excellent performance of this tablet, achieving figures much higher than those offered by the others. However, we can easily reach the 6 or 7 hours of screen, and even allow us to play repeatedly demanding games. We know, Amazon has done the homework, and we got some figures really remarkable for a tablet in this price range. The consumption of the tablet in response is very low, proof of the good optimization carried out with this new kindle fire HD 8. Unfortunately it does not have fast charge, and to refill the battery it will take about 6 hours to fill it completely. With its reduced power, one can surf the Internet and social networks, chat or watch videos without any difficulty, and even play games. Like Clash Royale without the experience of use is diminished. 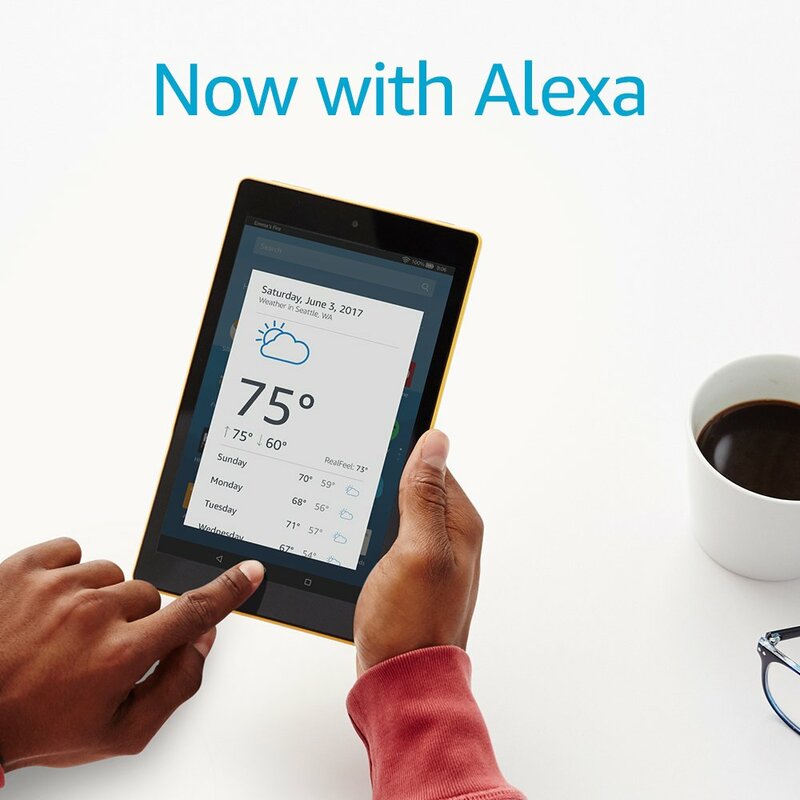 The most differential aspect of the Amazon Fire is without a doubt its operating system. Yes, we have Android, but not the Android we know, but a version customized to the extreme by Amazon, called Fire OS. Although Fire OS does not stop being a much customized version of Android. 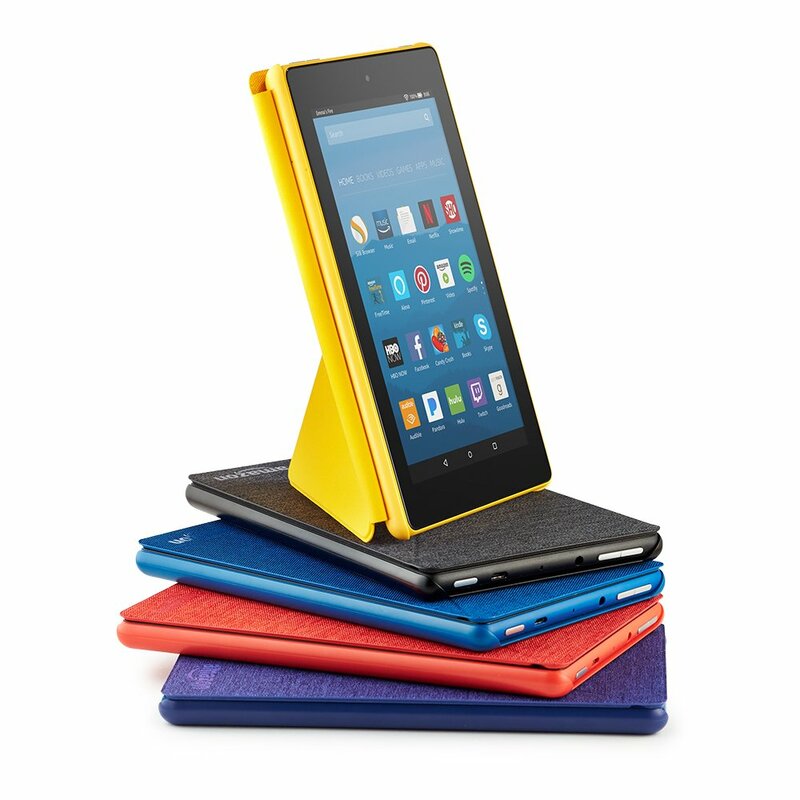 New kindle fire OS is a system designed to take full advantage of the benefits only for Amazon services. Which is relatively fine in a way. You may find the essential applications of Mail, Calendar, Web Browser and book reader. Fire tablet users will be able to continue using Amazon’s proposal to get free payment apps service until 2019. What we miss mainly is the absence of any Google application or service (although it can be integrated unofficially). Anyone can download APKs or use alternate stores (I’ve installed UpToDown and APToide) to fill some absences from Amazon’s application store. In the official Amazon store we can download Netflix. But when you open it will notify us that you need the services of Google to work. One can also configure the night mode with blue light filter not to tire their eyes at night. Truly, a very essential filter makes the screen look very red-orange. Navigating is fairly easy and visual, with fairly large icons and thumbnails, and they offer a presentation that appeals to the eye. The counterpart of this visual section lies in the use of basic system applications solely and exclusively from Amazon. Everything on any devices is considered by the price, for the good and for the bad. But in our analysis of the Amazon new kindle fire HD 8 we tried to overlook this section to be careful to evaluate the technical specs of it. We complete the review with a pretty clear idea about this tablet. Its strengths, weaknesses and user’e experiences. For whom is this tablet for or not? We tell you briefly. The first thing to note is that as a tablet with a simple design. But with relatively compact dimensions, and a finish made of plastic that offers an acceptable touch and great resistance to footprints. Battery is certainly good. As Amazon promises, about 2-3 hours of use daily it reached a 15% battery over 3 days. But If a user spends many hours with the tablet, that will undergo any day, however demanding. The rest of the components are not very good. But it is something that we can forgive you due to its price. What we did not like is the camera. Which does not meet the minimum as we demand in smartphone or a camera tablets. Display screen offers a good level of brightness. Although its resolution is not of the highest, and the produced reflexes are somewhat annoying. However, this is very convenient so that the performance offered by your processor is sufficient for any user. The new Amazon new kindle fire HD 8-inch costs of 109 euros the model with 16GB of storage and ads on the screen lock. If you are a member of Amazon Prime you can buy it for 89 euros to the August, 17. A very competitive price if you are looking for a basic multimedia tablet, for children or elderly people.